ISIS, Garland attack: Muhammad cartoon contest allegedly targeted by terror group. 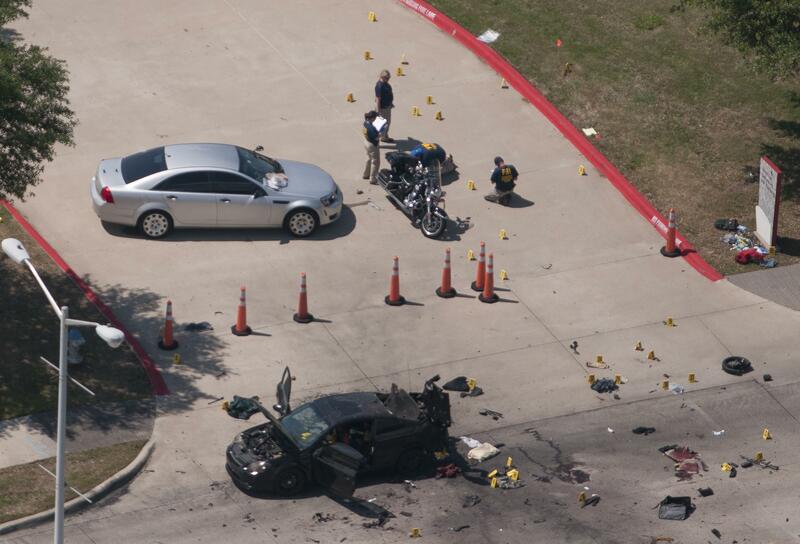 Investigators near the car used by two gunmen in Garland, Texas. No explosives were ultimately found in the vehicle, but several suspicious items inside it were destroyed as a precautionary measure. In a broadcast on its official radio channel Tuesday, the group said two Al Khilafa soldiers opened fire outside the event in Garland, a Dallas suburb. Al Khilafa is how ISIS refers to its soldiers. The gunmen, Elton Simpson and Nadir Soofi, wounded a security guard before police shot and killed them. U.S. authorities have not as of yet released or discussed any evidence that Simpson and Soofi had formal ties to ISIS or that the attack was planned or coordinated by ISIS figures—as the AP puts it, the terror group may be “opportunistically claiming the attack as its own” retroactively. Simpson did send a tweet not long before the shooting alluding to “the leader of the faithful,” which could be a reference to self-appointed ISIS “caliph” Abu Bakr al-Baghdadi.